Individualization. of Righteousness After the Exile. Renderings given in the English versions of the Hebrew root "ẓadaḳ" and its derivatives "ẓaddiḳ," "ẓedeḳ," "ẓedaḳh." 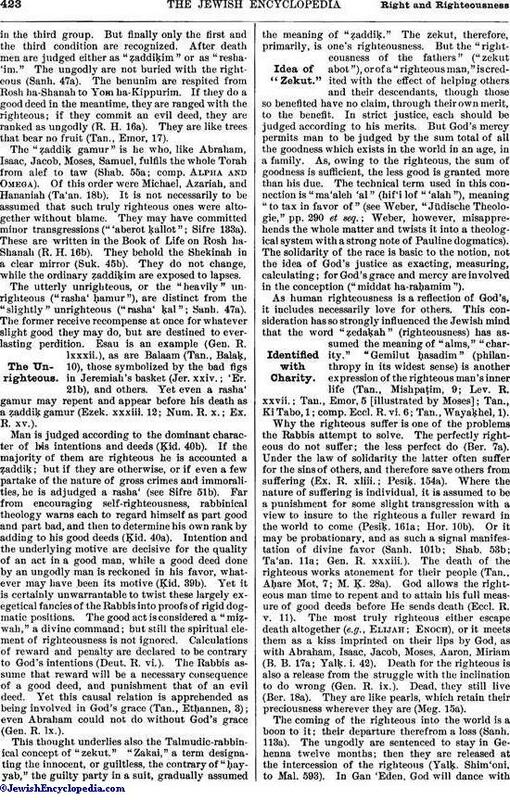 The use of "righteous" as a translation for "yashar" (="upright") is less frequent. "Just," "justice," "justify" also occur as equivalents for these Hebrew terms. The original implications of the root "ẓadaḳ" are involved in doubt. To be "hard," "even," and "straight" (said of roads, for instance) has been suggested as the primitive physical idea. More acceptable is the explanation that the root-notion conveyed is that a thing, man, or even God, is what it, or he, should be, that is, "normal," "fit." That conception may, without much difficulty, be recovered from some of the applications of the terms in the Bible. Weights and measures are called "ẓedeḳ" ("just" or "right"; Deut. xxv. 15; Lev. xix. 36; Job xxxi. 6; Ezek. xlv. 10). Paths are "ẓedeḳ," that is, as they should be, easy to travel (Ps. xxiii. 3). So with offerings, when brought in the proper manner and at the right time (Deut. xxxiii. 19; Ps. iv. 6 [A. V. 5], li. 21 [A. V. 19]). When a king or judge is as he should be he is "just" (Lev. xix. 15; Deut. i. 16; Prov. xxxi. 9). When speech is as it should be it is "truthful" (comp. Ps. lii.). 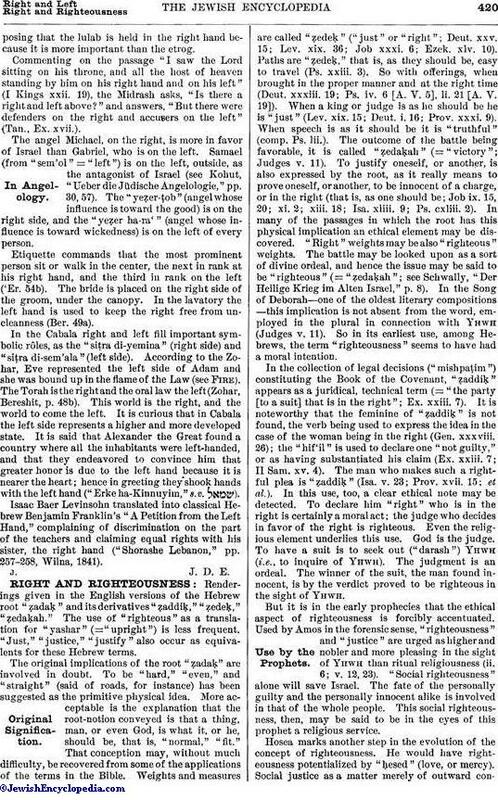 The outcome of the battle being favorable, it is called "ẓedaḳah" (= "victory"; Judges v. 11). To justify oneself, or another, is also expressed by the root, as it really means to prove oneself, or another, to be innocent of a charge, or in the right (that is, as one should be; Job ix. 15, 20; xi. 2; xiii. 18; Isa. xliii. 9; Ps. cxliii. 2). In many of the passages in which the root has this physical implication an ethical element may be discovered. "Right" weights may be also "righteous" weights. The battle may be looked upon as a sort of divine ordeal, and hence the issue may be said to be "righteous" (= "ẓedaḳah"; see Schwally, "Der Heilige Krieg im Alten Israel," p. 8). In the Song of Deborah—one of the oldest literary compositions—this implication is not absent from the word, employed in the plural in connection with Yhwh (Judges v. 11). So in its earliest use, among Hebrews, the term "righteousness" seems to have had a moral intention. In the collection of legal decisions ("mishpaṭim") constituting the Book of the Covenant, "ẓaddiḳ" appears as a juridical, technical term (= "the party [to a suit] that is in the right"; Ex. xxiii. 7). It is noteworthy that the feminine of "ẓaddiḳ" is not found, the verb being used to express the idea in the case of the woman being in the right (Gen. xxxviii. 26); the "hif'il" is used to declare one "not guilty," or as having substantiated his claim (Ex. xxiii. 7; II Sam. xv. 4). The man who makes such a rightful plea is "ẓaddiḳ" (Isa. v. 23; Prov. xvii. 15; et al.). In this use, too, a clear ethical note may be detected. To declare him "right" who is in the right is certainly a moral act; the judge who decides in favor of the right is righteous. Even the religious element underlies this use. God is the judge. To have a suit is to seek out ("darash") Yhwh (i.e., to inquire of Yhwh). The judgment is an ordeal. The winner of the suit, the man found innocent, is by the verdict proved to be righteous in the sight of Yhwh. But it is in the early prophecies that the ethical aspect of righteousness is forcibly accentuated. Used by Amos in the forensic sense, "righteousness" and "justice" are urged as higher and nobler and more pleasing in the sight of Yhwh than ritual religiousness (ii. 6; v. 12, 23). "Social righteousness" alone will save Israel. The fate of the personally guilty and the personally innocent alike is involved in that of the whole people. This social righteousness, then, may be said to be in the eyes of this prophet a religious service. Hosea marks another step in the evolution of the concept of righteousness. He would have righteousness potentialized by "ḥesed" (love, or mercy). Social justice as a matter merely of outward conduct,and manifest only in public adjustments of institutions and conditions, will not bring about the rejuvenescence of the nation. Inner repentance, spiritual consideration of one's neighbor and brother, yielding love, not mechanical justice alone, are the components of righteousness (vi. 1-4, x. 12). Isaiah proceeds along the lines indicated by his predecessors. "Justice," or "righteousness," is solicitude for the weak and helpless (i. 16 et seq., 27; x. 2). This righteousness is true religion; Israel is expected to be devoted to it. The moral order of the world is founded in such righteousness, which metes out strict justice (v. 7, xxviii. 17, xxix. 13). This justice, inherent in God's supreme providence, will bring about the salvation of the Remnant of israel (vii. 9). Isaiah looks forward to the coming of a time when Jerusalem, no longer enslaved to mere ritual piety while steeped in injustice, will be called "the fortress of righteousness" (i. 26, Hebr.). Jeremiah's understanding of righteousness is virtually the same as Isaiah's (see Jer. xxii. 3, which seems to embody his ideas of what it embraces, though the term is not used). He looks forward to the reestablishing of the Davidic kingdom under "a righteous branch," a ruler who will do justice and who will deserve the name "Yhwh our Righteousness" (xxiii. 5 et seq., Hebr.). Jeremiah's faith in the righteous character of God's government was sorely put to the test both by his own personal experience and by the conditions prevailing in his own day. Yet he acknowledges that Yhwh is in the right ("ẓaddiḳ"), though he can not forego asking why the wicked prosper (xii. 1). Yhwh is a "righteous judge," probing the motives of human conduct (xi. 20). In Deut. xvi. 20 the pursuit of righteousness is solemnly inculcated. "Righteous" in these prophetic passages is synonymous with "moral." He deserves the designation who not only refrains from wrong-doing but is strenuous in his efforts to establish right. To suffer wrong to be done to another is almost equivalent to doing it. Hence the righteous endeavor to see that the weak, the poor, the orphaned, and the widowed secure their rights. The conception that the righteousness of God also involves positive activity in behalf of right, not mere abstinence from wrong-doing, is accentuated. The moral law is so administered that justice will be done. In the lives of the "righteous" whose names and characters both have-been preserved in the national history these qualities were dominant. Noah was "a righteous" man in his generation. He was spared while the wicked perished (Gen. vi. 9, vii. 1). If there had been righteous ones in Sodom they would not have shared the fate of the city. Abraham was warned of the impending catastrophe because it was certain that he would teach his descendants "to do judgment and righteousness" (Gen. xviii. 19, 23-25). Abraham's trust in Yhwh is reckoned unto him, "for righteousness" (Gen. xv. 6; a statement which, however obscure, certainly does not bear out the construction put on it by Christian theologians, from St. Paul to the present, as little as does Hab. ii. 4—"the righteous shall live by his faith" [Hebr.]). In Habakkuk "the righteous" has taken on an entirely new meaning. It stands for Israel as represented by the "pious," the "meek," the "poor," the "remnant." Israel will not be disturbed by the seeming falsification of its trust and confidence involved in the actual conditions of the day. For the moment Babylon, the "unrighteous," may be victorious; but ultimately the righteousness of God's government will be manifest in the victory of the "righteous." This application of "righteous" is common in exilic and post-exilic writings (comp. Isa. xxvi. 10). In (Deutero) Isa. xlii. 6 the "servant of Yhwh" (Hebr.) is this righteous one; indeed, the "righteousness" of God is manifested in the advent of Cyrus (Isa. xliv. 28). God supports His messengers "with the right hand" of His "righteousness" (Isa. xli. 10)—that is, He will insure their triumph. This "righteousness," which is the victorious purpose of God's providence, is not conditioned or expressed by ritual practises. The contrary is the case. The people who believe that they have done right (Isa. lviii. 2) are told that fasting is inoperative, that justice and love are the contents of righteousness. Righteousness in this sense is the recurring refrain of the second Isaiah's preaching. The remnant of Israel, having suffered, has been purified and purged of its sins. Its triumph, therefore, will establish God's righteousness, for the triumph of the wicked (i.e., Babylon) is unthinkable in view of the moral order of things (Isa. xlvii. 6, li. 1-7, lii. 3-5). With the Exile the individualization of righteousness begins to be recognizable in Hebrew thought. The accountability of man for his conduct is phrased most strongly by writers of this period (Jer. xxxi. 29-30; Ezek. xviii. 2-4). In Ezekiel, a few instances excepted (xvi. 52, xxiii. 45, xlv. 9-10), "righteous" and "righteousness" express the religious relation of individuals to God (xiii. 22, xiv. 14, xviii. 5 et seq.). The plural of "ẓedaḳah" (if the text is correct) connotes good deeds proceeding from one's religious character (iii. 20, xviii. 24, xxxiii. 13). The content of this righteousness is preponderatingly ethical, not ritual. The Book of Job approaches the problem of God's righteousness from a new point of view. The suffering of the righteous is its theme as it is that of other Biblical passages (Mal. iii. 15-18; Ps. xxxvii., xxxix., xlix., lxxiii.). That sin and suffering are corresponding terms of one equation is the thesis defended by Job's friends; but Job will not accept it; conscious of his rectitude, he rebels against it. He challenges the Almighty to meet him in a regular judicial proceeding. The book states the problem, but furnishes no answer (see Job, Book of; Optimism and Pessimism). 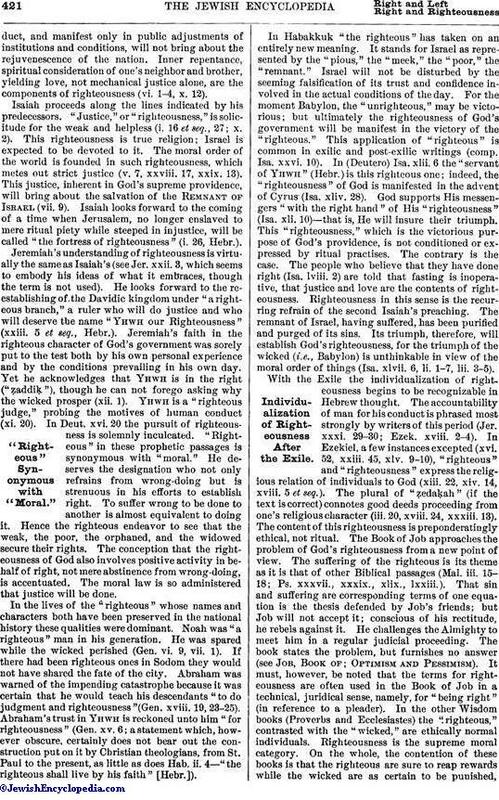 It must, however, be noted that the terms for righteousness are often used in the Book of Job in a technical, juridical sense, namely, for "being right" (in reference to a pleader). In the other Wisdom books (Proverbs and Ecclesiastes) the "righteous," contrasted with the "wicked," are ethically normal individuals. Righteousness is the supreme moral category. On the whole, the contention of these books is that the righteous are sure to reap rewards while the wicked are as certain to be punished,though Ecclesiastes is not consistent in the exposition of the doctrine of retribution. In the Book of Psalms "the righteous" more frequently represents a party than individuals—"the meek," "the lowly"; that is, the faithful who, in spite of persecution, cling to God's law. In the Maccabean age these became the "Assidaioi" (the Ḥasidim). Their triumphs are sung and their virtues and faith are extolled. Their righteousness is both social and personal (comp. Ps. vii., xviii., xxv., xxxii., xxxiii., xxxvii., xli., lxiv., xcvii., cvi., cix. ; see Godliness). 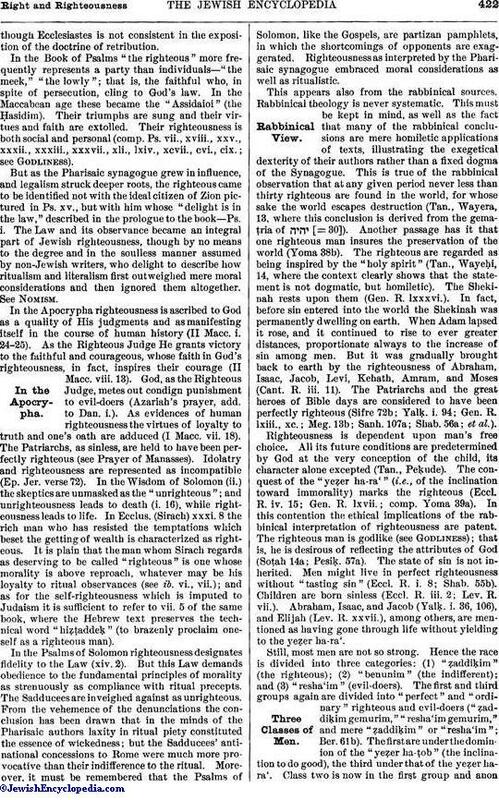 But as the Pharisaic synagogue grew in influence, and legalism struck deeper roots, the righteous came to be identified not with the ideal citizen of Zion pictured in Ps. xv., but with him whose "delight is in the law," described in the prologue to the book—Ps. i. 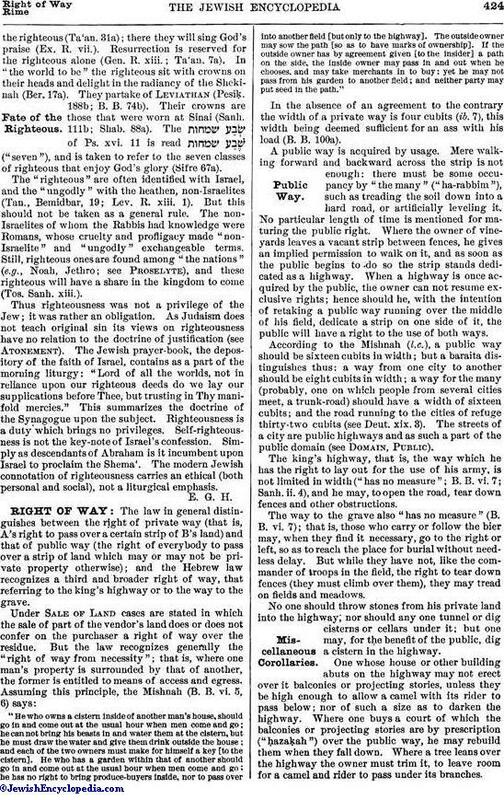 The Law and its observance became an integral part of Jewish righteousness, though by no means to the degree and in the soulless manner assumed by non-Jewish writers, who delight to describe how ritualism and literalism first outweighed mere moral considerations and then ignored them altogether. See Nomism. In the Apocrypha righteousness is ascribed to God as a quality of His judgments and as manifesting itself in the course of human history (II Macc. i. 24-25). As the Righteous Judge He grants victory to the faithful and courageous, whose faith in God's righteousness, in fact, inspires their courage (II Macc. viii. 13). God, as the Righteous Judge, metes out condign punishment to evil-doers (Azariah's prayer, add. to Dan. i.). As evidences of human righteousness the virtues of loyalty to truth and one's oath are adduced (I Macc. vii. 18). The Patriarchs, as sinless, are held to have been perfectly righteous (see Prayer of Manasses). Idolatry and righteousness are represented as incompatible (Ep. Jer. verse 72). In the Wisdom of Solomon (ii.) the skepties are unmasked as the "unrighteous"; and unrighteousness leads to death (i. 16), while righteousness leads to life. In Ecclus. (Sirach) xxxi. 8 the rich man who has resisted the temptations which beset the getting of wealth is characterized as righteous. It is plain that the man whom Sirach regards as deserving to be called "righteous" is one whose morality is above reproach, whatever may be his loyalty to ritual observances (see ib. vi., vii. ); and as for the self-righteousness which is imputed to Judaism it is sufficient to refer to vii. 5 of the same book, where the Hebrew text preserves the technical word "hiẓṭaddeḳ" (to brazenly proclaim oneself as a righteous man). In the Psalms of Solomon righteousness designates fidelity to the Law (xiv. 2). But this Law demands obedience to the fundamental principles of morality as strenuously as compliance with ritual precepts. The Sadducees are inveighed against as unrighteous. From the vehemence of the denunciations the conclusion has been drawn that in the minds of the Pharisaic authors laxity in ritual piety constituted the essence of wickedness; but the Sadducees' antinational concessions to Rome were much more provocative than their indifference to the ritual. Moreover, it must be remembered that the Psalms of Solomon, like the Gospels, are partizan pamphlets, in which the shortcomings of opponents are exaggerated. Righteousness as interpreted by the Pharisaic synagogue embraced moral considerations as well as ritualistic. This appears also from the rabbinical sources. Rabbinical theology is never systematic. This must be kept in mind, as well as the fact that many of the rabbinical conclusions are mere homiletic applications of texts, illustrating the exegetical dexterity of their authors rather than a fixed dogma of the Synagogue. This is true of the rabbinical observation that at any given period never less than thirty righteous are found in the world, for whose sake the world escapes destruction (Tan., Wayera, 13, where this conclusion is derived from the gemaṭria of [= 30]). Another passage has it that one righteous man insures the preservation of the world (Yoma 38b). The righteous are regarded as being inspired by the "holy spirit" (Tan., Wayeḥi, 14, where the context clearly shows that the statement is not dogmatic, but homiletic). The Shekinah rests upon them (Gen. R. lxxxvi.). In fact, before sin entered into the world the Shekinah was permanently dwelling on earth. When Adam lapsed it rose, and it continued to rise to ever greater distances, proportionate always to the increase of sin among men. But it was gradually brought back to earth by the righteousness of Abraham, Isaac, Jacob, Levi, Kehath, Amram, and Moses (Cant. R. iii. 11). The Patriarchs and the great heroes of Bible days are considered to have been perfectly righteous (Sifre, 72b; Yalḳ. i. 94; Gen. R. lxiii., xc. ; Meg. 13b; Sanh. 107a; Shab. 56a; et al.). Righteousness is dependent upon man's free choice. All its future conditions are predetermined by God at the very conception of the child, its character alone excepted (Tan., Peḳude). The conquest of the "yeẓer ha-ra' " (i.e., of the inclination toward immorality) marks the righteous (Eccl. R. iv. 15; Gen. R. lxvii. ; comp. Yoma, 39a). In this contention the ethical implications of the rabbinical interpretation of righteousness are patent. The righteous man is godlike (see Godliness); that is, he is desirous of reflecting the attributes of God (Soṭah 14a; Pesiḳ. 57a). The state of sin is not inherited. Men might live in perfect righteousness without "tasting sin" (Eccl. R. i. 8; Shab. 55b). Children are born sinless (Eccl. R. iii. 2; Lev. R. vii.). Abraham, Isaac, and Jacob (Yalḳ. i. 36, 106), and Elijah (Lev. R. xxvii. ), among others, are mentioned as having gone through life without yielding to the yeẓer ha-ra'. Still, most men are not so strong. Hence the race is divided into three categories: (1) "ẓaddiḳim" (the righteous); (2) "benunim" (the indifferent); and (3) "resha'im" (evil-doers). The first and third groups again are divided into "perfect" and "ordinary" righteous and evil-doers ("ẓaddiḳim gemurim," "resha'im gemurim," and mere "ẓaddiḳim" or "resha'im"; Ber. 61b). The first are under the dominion of the "yeẓer ha-ṭob" (the inclination to do good), the third under that of the yeẓer hara'. Class two is now in the first group and anonin the third group. But finally only the first and the third condition are recognized. After death men are judged either as "ẓaddiḳim" or as "resha'im." The ungodly are not buried with the righteous (Sanh. 47a). The benunim are respited from Rosh ha-Shanah to Yom ha-Kippurim. If they do a good deed in the meantime, they are ranged with the righteous; if they commit an evil deed, they are ranked as ungodly (R. H. 16a). They are like trees that bear no fruit (Tan., Emor, 17). The "ẓaddiḳ gamur" is he who, like Abraham, Isaac, Jacob, Moses, Samuel, fulfils the whole Torah from alef to taw (Shab. 55a; comp. Alpha and Omega). Of this order were Michael, Azariah, and Hananiah (Ta'an. 18b). It is not necessarily to be assumed that such truly righteous ones were altogether without blame. They may have committed minor transgressions ("'aberot ḳallot"; Sifre 133a). These are written in the Book of Life on Rosh ha-Shanah (R. H. 16b). They behold the Shekinah in a clear mirror (Suk. 45b). They do not change, while the ordinary ẓaddiḳim are exposed to lapses. The utterly unrighteous, or the "heavily" unrighteous ("rasha' ḥamur"), are distinct from the "slightly" unrighteous ("rasha' ḳal"; Sanh. 47a). The former receive recompense at once for whatever slight good they may do, but are destined to everlasting perdition. Esau is an example (Gen. R. lxxxii. ), as are Balaam (Tan., Balaḳ, 10), those symbolized by the bad figs in Jeremiah's basket (Jer. xxiv. ; 'Er. 21b), and others. Yet even a rasha' gamur may repent and appear before his death as a ẓaddiḳ gamur (Ezek. xxxiii. 12; Num. R. x.; Ex. R. xv.). Man is judged according to the dominant character of his intentions and deeds (Ḳid. 40b). If the majority of them are righteous he is accounted a ẓaddiḳ; but if they are otherwise, or if even a few partake of the nature of gross crimes and immoralities, he is adjudged a rasha' (see Sifre 51b). Far from encouraging self-righteousness, rabbinical theology warns each to regard himself as part good and part bad, and then to determine his own rank by adding to his good deeds (Ḳid. 40a). Intention and the underlying motive are decisive for the quality of an act in a good man, while a good deed done by an ungodly man is reckoned in his favor, whatever may have been its motive (Ḳid. 39b). Yet it is certainly unwarrantable to twist these largely exegetical fancies of the Rabbis into proofs of rigid dogmatic positions. The good act is considered a "miẓwah," a divine command; but still the spiritual element of righteousness is not ignored. Calculations of reward and penalty are declared to be contrary to God's intentions (Deut. R. vi.). The Rabbis assume that reward will be a necessary consequence of a good deed, and punishment that of an evil deed. Yet this causal relation is apprehended as being involved in God's grace (Tan., Etḥannen, 3); even Abraham could not do without God's grace (Gen. R. lx.). This thought underlies also the Talmudic-rabbinical concept of "zekut." "Zakai," a term designating the innocent, or guiltless, the contrary of "ḥayyab," the guilty party in a suit, gradually assumed the meaning of "ẓaddiḳ." The zekut, therefore, primarily, is one's righteousness. But the "righteousness of the fathers" ("zekut abot"), or of a "righteous man,"is credited with the effect of helping others and their descendants, though those so benefited have no claim, through their own merit, to the benefit. In strict justice, each should be judged according to his merits. But God's mercy permits man to be judged by the sum total of all the goodness which exists in the world in an age, in a family. As, owing to the righteous, the sum of goodness is sufficient, the less good is granted more than his due. The technical term used in this connection is "ma'aleh 'al" (hif'i lof "'alah"), meaning "to tax in favor of" (see Weber, "Jüdische Theologie," pp. 290 et seq. ; Weber, however, misapprehends the whole matter and twists it into a theological system with a strong note of Pauline dogmatics). The solidarity of the race is basic to the notion, not the idea of God's justice as exacting, measuring, calculating; for God's grace and mercy are involved in the conception ("middat ha-raḥamim"). As human righteousness is a reflection of God's, it includes necessarily love for others. This consideration has so strongly influenced the Jewish mind that the word "ẓedaḳah" (righteousness) has assumed the meaning of "alms," "charity." "Gemilut ḥasadim" (philanthropy in its widest sense) is another expression of the righteous man's inner life (Tan., Mishpaṭim, 9; Lev. R. xxvii. ; Tan., Emor, 5 [illustrated by Moses]; Tan., Ki Tabo, 1; comp. Eccl. R. vi. 6; Tan., Wayaḳhel, 1). Why the righteous suffer is one of the problems the Rabbis attempt to solve. The perfectly righteous do not suffer; the less perfect do (Ber. 7a). Under the law of solidarity the latter often suffer for the sins of others, and therefore save others from suffering (Ex. R. xliii. ; Pesiḳ. 154a). Where the nature of suffering is individual, it is assumed to be a punishment for some slight transgression with a view to insure to the righteous a fuller reward in the world to come (Pesiḳ. 161a; Hor. 10b). Or it may be probationary, and as such a signal manifestation of divine favor (Sanh. 101b; Shab. 53b; Ta'an. 11a; Gen. R. xxxiii.). The death of the righteous works atonement for their people (Tan., Aḥare Mot, 7; M. Ḳ. 28a). God allows the righteous man time to repent and to attain his full measure of good deeds before He sends death (Eccl. R. v. 11). The most truly righteous either escape death altogether (e.g., Elijah; Enoch), or it meets them as a kiss imprinted on their lips by God, as with Abraham, Isaac, Jacob, Moses, Aaron, Miriam (B. B. 17a; Yalḳ. i. 42). Death for the righteous is also a release from the struggle with the inclination to do wrong (Gen. R. ix.). Dead, they still live (Ber. 18a). They are like pearls, which retain their preciousness wherever they are (Meg. 15a). The coming of the righteous into the world is a boon to it; their departure therefrom a loss (Sanh. 113a). The ungodly are sentenced to stay in Gehenna twelve months; then they are released at the intercession of the righteous (Yalḳ. Shim'oni, to Mal. 593). In Gan 'Eden, God will dance withthe righteous (Ta'an. 31a); there they will sing God's praise (Ex. R. vii.). Resurrection is reserved for the righteous alone (Gen. R. xiii. ; Ta'an. 7a). In "the world to be" the righteous sit with crowns on their heads and delight in the radiancy of the Shekinah (Ber. 17a). They partake of Leviathan (Pesiḳ. 188b; B. B. 74b). Their crowns are those that were worn at Sinai (Sanh. 111b; Shab. 88a). The of Ps. xvi. 11 is read ("seven"), and is taken to refer to the seven classes of righteous that enjoy God's glory (Sifre 67a). The "righteous" are often identified with Israel, and the "ungodly" with the heathen, non-Israelites (Tan., Bemidbar, 19; Lev. R. xiii. 1). But this should not be taken as a general rule. The non-Israelites of whom the Rabbis had knowledge were Romans, whose cruelty and profligacy made "non-Israelite" and "ungodly" exchangeable terms. Still, righteous ones are found among "the nations" (e.g., Noah, Jethro; see Proselyte), and these righteous will have a share in the kingdom to come (Tos. Sanh. xiii.). Thus righteousness was not a privilege of the Jew; it was rather an obligation. As Judaism does not teach original sin its views on righteousness have no relation to the doctrine of justification (see Atonement). The Jewish prayer-book, the depository of the faith of Israel, contains as a part of the morning liturgy: "Lord of all the worlds, not in reliance upon our righteous deeds do we lay our supplications before Thee, but trusting in Thy manifold mercies." This summarizes the doctrine of the Synagogue upon the subject. Righteousness is a duty which brings no privileges. Self-righteousness is not the key-note of Israel's confession. Simply as descendants of Abraham is it incumbent upon Israel to proclaim the Shema'. The modern Jewish connotation of righteousness carries an ethical (both personal and social), not a liturgical emphasis.